Elisabeth Adams, Concord, MA; Helen Haseltine Plowden, Aspley Guise; purchased by NGA, 1968. The Poetry of Light: Venetian Drawings from the National Gallery of Art, National Gallery of Art, Washington, 2006. The Poetry of Light - La poesia della luce: Venetian Drawings from the National Gallery of Art, Museo Correr, Venice, Venice, 2014 - 2015, no. 134. Plowden, Helen Haseltine. William Stanley Haseltine: Sea and Landscape Painter (1835-1900. Frederick Muller, London, 1947: facing 115. Simpson, Marc, et al. Expressions of Place: The Art of Wiliam Stanley Haseltine. Fine Arts Museums of San Francisco, 1992: p. 126. 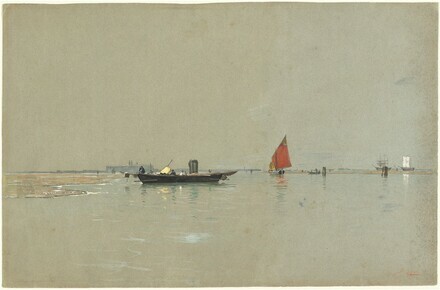 American Watercolor in the Age of Homer and Sargent. Exh. cat. Philadelphia Museum of Art, 2017: 100, no. 77.